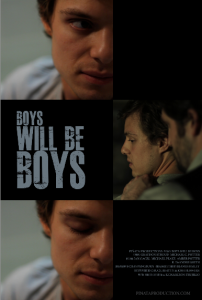 domestic violence short drama Boys Will Be Boys. (newcomer Grayden Stroud), a young man assaulted by his long-time partner Chris (Michael C.
and faces the guests at his birthday party. film category for Vanessa Rising, was a perfect fits for the surrealistic drama. Chris Mercier. Yummy food, a full bar and other swag goodies will be available. serves as Executive Director for the company.